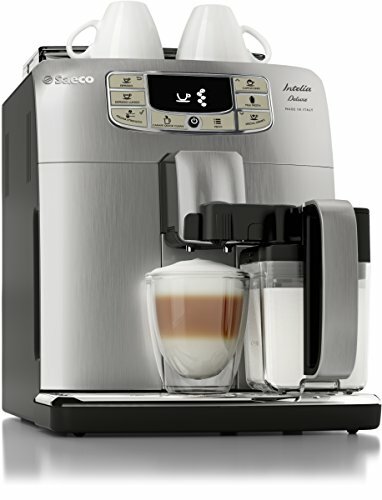 If you want the coffee house espresso experience without leaving the comfort of your pajamas, you must check out the Saeco Intelia Deluxe Automatic Espresso Machine. Looks nice, right? This caffeinated work of art will not only look great on your countertop; it will give you that rich, flavorful espresso experience every time you brew. Today I will review the Intelia Espresso Deluxe Espresso Automatic Machine to help you decide if this brewer is right for you. My review today will be based on reviews from verified customers whom I affectionately call my Coffee Brigade. My caffeinated comrades are so passionate about their morning brew they endorse only the very best and help others steer clear of the worst through their online reviews. By the end of this piece, my hope is you will have all the information you need to decide if this is a match made in coffee heaven. Let’s get started! What’s its 30-second sales pitch? Let’s first address the elephant in the room: the cost. This is not your typical pod-based machine that rhymes with Beurig; it’s an automated coffee machine baristas would be proud to display on their countertop at home. Let’s find out why. You had me at divine coffee. I am a proud member of the Coffee Brigade after all. If you are like me, all automated coffee machine sales pitches sound the same. They offer convenience, save time, quality brew, and the like. If I’m going to spend more than a thousand dollars on a coffee machine, I’ll need more convincing than that. First, we’ll look at its best features. One-touch brewing is ideal for people like me that are half asleep when brewing their morning cup. Do you see those beans on the side? Those five beans signal how strong a cup you prefer which is easily changed based on your mood and bean selection. The control panel allows users to select a standard drink like an espresso or cappuccino, or choose a “special drink” option which is a customized cup you created and stored for future brews. Remember, this is not your typical pod-based automated brewer; it is a professional espresso machine for your home that grinds fresh beans for a flavorful coffee experience each time. 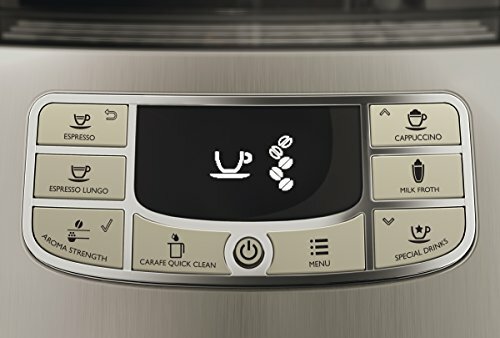 Imagine—a machine that can deliver an espresso, café lungo, café crème, espresso macchiato, cappuccino, latte macchiato and more with just the push of a button, exactly how you like it, no barista required! Reviewers loved the varieties of drink options available thanks to the milk frother—which brings us to our next best feature! You can’t have a café lungo or cappuccino without frothed milk! The built-in milk carafe froths the milk twice then pours a splash-free creamy layer on the top of your cup at the exact temperature you would expect. 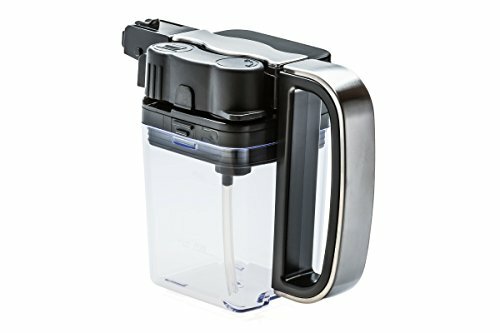 What’s great about this carafe is that it’s dishwasher safe and can be stored in the refrigerator. Any sophisticated coffee drinker knows it’s best to grind your beans immediately before brewing to create the most flavorful coffee experience. The Saeco Philips Intelia Deluxe Espresso Machine features 100% ceramic grinders that can be adjusted ten different ways based on your bean and your taste buds (more about the grinder below under benefits). These ceramic grinders never overheat ensuring a perfect silent grind each time. Who loves waiting for automatic coffee machines to warm up before you hit enter? Anyone? No! It is super annoying to stand and wait while you listen to your coffee machine warm up the water. The reason you bought an automated brewer is that you wanted on-demand coffee without the wait. 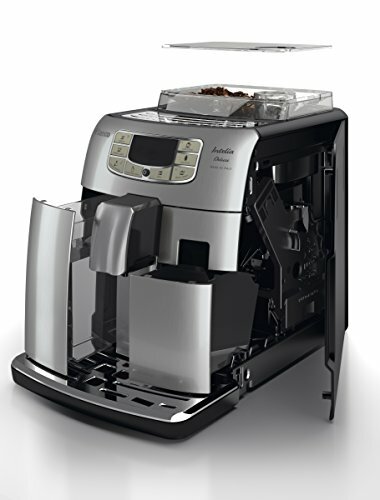 The Saeco Philips Intelia Deluxe Espresso Machine has a quick heat boiler that allows immediate brewing each time. No more waiting and hoping to start the process, it’s automatically ready to go! So far, this automated coffee machine sounds awesome. Still, it’s $1,299, so any average person (myself included) would need more convincing. You can check out the latest prices and discounts here though! Features aside, what other benefits does the Intelia Deluxe Espresso Machine offer? Saeco has developed a removable brewing group to ensure the best brewing experience each time. With one simple click, this integral piece of the brewing process is removed from the machine for cleaning. Any barista knows your coffee-based drink is only as good as the beans and machine you use, and the quality of the brewing environment (a.k.a. don’t brew in a machine littered with old, stale grinds from yesterday’s cup). The ability to thoroughly clean this unit is a huge selling point, especially for people that have ditched their automated brewer because it is difficult to clean and maintain. It’s time to throw away that stand-alone grinder that is a pain to clean: the Intelia Deluxe Espresso Machine has its own! This grinder has ten settings so the next time you host a gathering, one guest can have an extra strong shot of espresso using extra-fine grounds to brew, while another can sip on a light roast brewed using coarser grounds using the same machine. The built-in grinder paired with the milk carafe and frother provides many options which are sure to please a crowd. This machine will make you look good. When a machine lives on the counter of a room you spend a lot of time in, it matters! Since the housing and boiler of this machine are crafted with stainless steel to resist scratches and scruffs, it will look good long after its first use. The bean container on top is visible, so there’s no guessing whether you are running low on beans, and it’s small enough to not dominate your living space. Remember the people I referenced earlier that would help inform this review? Well, they are passionate about all-things-coffee related and have much to say about the Intelia Deluxe Espresso Machine. Online reviewers loved how easy it was to both operate and clean this machine. Many referenced the start-up manual that made it easy to set up their machine and brew their first cup, while others appreciated how easy it is to clean compared to other automatic brewers. As mentioned previously, a big selling point for this machine is the removable brew group that allows for easy and efficient cleaning. This is critical in an espresso machine where old grinds can create a stale brewing environment affecting the taste of your drink. The brew group should be washed or rinsed weekly, and the milk carafe should be rinsed or washed after each use to keep the espresso tasting fresh with each brew. Another benefit of the Intelia Deluxe is the automated descaling process, so no more guessing how to do it manually; this machine does it for you! The taste. Reviewers love the fresh, full-bodied taste experience from the Intelia Deluxe, with many commenting that their cup tastes better than their local coffee shop variety. That is the kind of machine every coffee enthusiast wants! Is this one the right one for you? I hope you have all the information you need to decide!